Heart Cone Chair. Designed by Verner Panton. 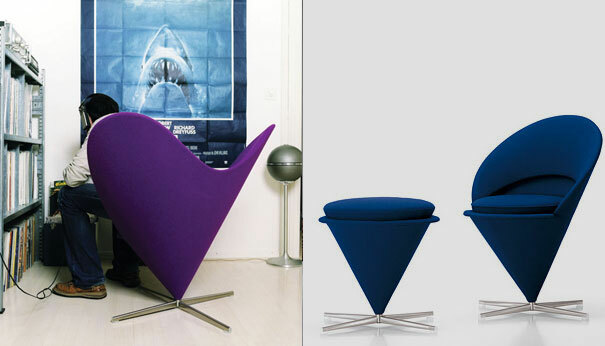 Designed in 1959 by Denmark’s Verner Panton, the Heart Cone Chair began as a variant of the slightly more demure Cone Chair of 1958. The metamorphosis went from the fantastical to the fanciful: Cone Chair looks like an ice cream delicacy and Heart Cone Chair like a box of chocolates. Whoever would have thought I’d grow so fond of sweets and hearts? 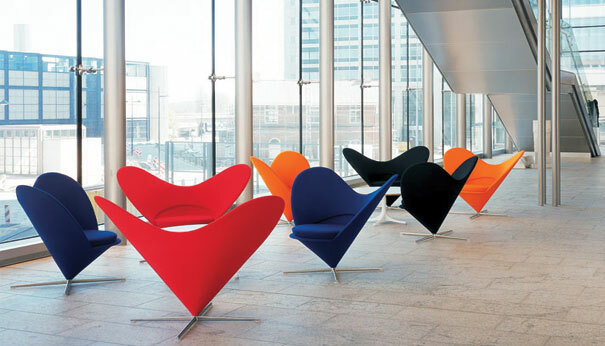 Panton once worked as an assistant for Arne Jacobsen—note Heart Cone’s nod to the sensuous Egg Chair. 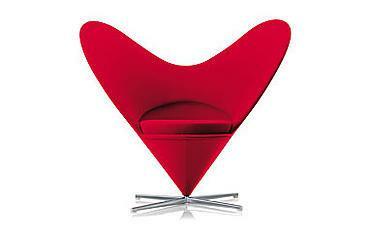 Although it has lovely contours, don’t oversimplify Panton’s Heart Cone Chair. It’s meant to play with lots of iconic shapes, not just the bloody organ: “Heart Cone Chair has large, projecting wings reminiscent of Mickey Mouse ears that could also, however, be interpreted as a contemporary take on the classic wing chair.” Constructed of durable materials—laminated body, stainless base, polyurethane foam upholstery—Heart Cone Chair doesn’t compromise durability for style. And given the delicious color choices, this Panton gem is easy to swallow. Of course, there’s the red, but also golden yellow, rust, and chocolate in warm tones; and blue, green, and steel in the cool range.